The Kentucky Hospital Association is governed by a 22-member Board of Trustees. The composition includes 19 hospital chief executive officers (CEOs), a hospital trustee representative, a physician and the KHA President. Twelve CEOs are elected from their districts (3 from each of the KHA districts). Other members include the Chair of the Board, Chair-elect, Immediate Past Chair, Treasurer, Legislative Committee Chair and AHA Delegates. KHA policy is established by the Board of Trustees acting upon recommendations made by various committees and forums. The Board generally meets five times per year. There are also Boards for the Kentucky Hospital Research and Education Foundation (KHREF), KHA Solutions Group, the Kentucky Institute for Patient Safety and Quality (KIPSQ) and the Kentucky Hospitals' Circle of Friends Political Action Committee. Visit the Boards page for more details. Geographically, KHA is divided into four districts: Blue Grass, Cumberland, Ohio Valley and Twin Lakes. The districts meet twice annually for the purpose of discussing key KHA issues. At the February meeting, district officers are elected and nominations are considered for the KHA Board members. Each member is assigned to a district based on geographic location. Getting involved at the District Level is a great way to meet with your local peers and have an impact on the Association. 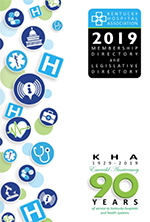 KHA’s committees and forums help shape Association policy and provide another excellent opportunity for hospital executives to get involved. Visit the Committees and Forums page for more details.